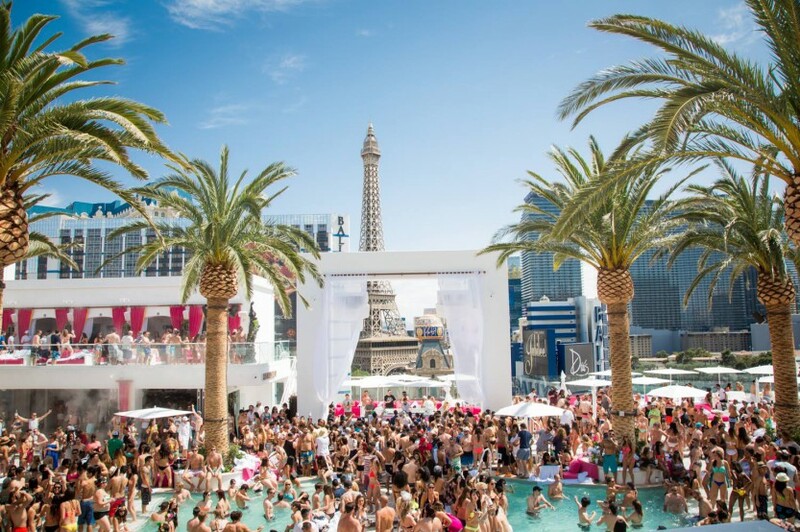 Drais Beachclub located inside of the Cromwell Hotel is a powerhouse of the Day Club scene in Las Vegas. Located on the busiest street corner in the city and being on the top floor of the hotel, Drais Beachclub has the absolute best view in all of Las Vegas. Drais Beachclub was designed as an indoor and outdoor club. There is a swimming pool that runs right down the middle of the outside area. This also make Drais as one of the top nightclub destinations in Las Vegas. Drais was built with Cabanas and Daybeds in mind. Cabanas provide needed shade, flat screen tv’s and seating. This makes for a comfortable and fun day. The cabana areas are roped off with their own security staff so the general public does not have access to these VIP areas. Groups that get cabana service will have a shaded area to sit and dance, beautiful waitresses & wait staff. Also, cabana service reservations have a separate expedited entry into the club.